I was running the numbers from the past year on how people first heard about our church. During membership classes each person takes a short survey, and indicates how they first heard about First Baptist Orlando. I get those reports, and once a year I average the responses, with particular interest in the areas I am involved in. I always want to know how people found out about us in the mass-media, multi-message haystack we exist in. It is no surprise that the top two responses are always “invited by family” or “invited by friend”. Fully 41% of people who joined our church last year first came because of a personal relationship (more if you count those invited by staff). The people in your church or organization are your best marketing resource. In 2009, TV was 3rd down the list, behind family and friends, at 15%. That is, 15% of the people who joined the church say they first heard of us through TV. In 2010 that percentage climbed almost two points: 16.6% of the people who join the church first heard about us from TV. We’ve been on TV for almost 50 years. Two years ago we added a 30-minute program on some local stations. We have an established audience, and get great response from the programming. In the last quarter there has been one significant shift, website/internet has moved into number 4 with 9% (that would include web streaming, facebook and twitter.) Over the past few months we have been enhancing what we are doing in social media and the internet. I will be watching this trend. It’s not the only indicator of a successful strategy, but it is one of the indicators. Social media has proven to be an extremely cost effective tool for us. it can be for you, too. I wish more churches were focusing on the tools available and the potential for having real impact. In contrast, the newspaper had a big fat 0% last year. Not one person said they first heard about us through the paper. We run a weekly ad in the religion section, and once in a while run other advertising. To be fair, we don’t throw a lot of money into newspaper advertising, so we should not expect to see a lot of results. We make decisions on where to spend money on marketing using numbers like these, and as we pull back from print, we see print be less effective. You can set your self up in sort of a self-fulfilling prophecy cycle. Even so, I don’t think we will be increasing our print ad budget this year. Yellow pages/phone book had 0.33%. We do keep a presence in the print phone book, but we spend most of our “yellow pages’ money on the online components, and those results would appear in the web statistic. Overall, I’m pleased with these numbers. Again, this isn’t the only way we should measure results of our marketing efforts. But it is an interesting number to track. These are people who have made the journey from knowing nothing about our local body to committing to be a member of the church. We should be interested in knowing how they first heard about us. Ever notice how gear doesn’t break when you don’t need it? It always breaks when you need it most. Last year our IT department began the process of replacing switches and other gear that was beyond 7 years old. They wanted to replace it all, but these things are expensive. So, slowly, they are swapping out old tech for new. Unfortunately, this past weekend one of the old pieces that had not been replaced yet went down. It was in a core part of the network, and all access was severed. There was nothing internal and nothing external. No email, no servers, no internet, no http://www.firstorlando.com, nothing. Well, church has been happening a long time without internet, so we should have no worries, right? For the most part, but you just don’t realize how much you rely on something until it’s gone. The network went down saturday afternoon, right before we began prepping for the service. We store lyric documents and sermon notes on a serve, for easy access. We could not get them. Luckily, I had downloaded them to my Outlook, and was able to put them on a flash drive and we loaded them up. We could not stream the services. not only could no one get to the website to launch the player, we couldn’t even send the signal out. we were able to record the video for later upload in our On Demand section. But, we literally have hundreds of people who watch us each week. We went to Facebook and twitter to spread the word, using our 3G enable phones we could still access them. we use Planning Center Online to plan the services, and follow it during the service as well. On Sunday one of our technical people brought in his own mobile hotspot and shared it on the mini network we have in the Worship Center, so we could still follow. not powerful enough for the campus, but it worked like a charm for what they needed. The IT guys worked some long hours, and at one point we had access. Then about 15 minutes before service start it went down again. They were able to get internal servers up and running, but external connection was still out. On Monday we got some help, and Monday afternoon it came back on. We hope it stays working. While it was down we could not access anything we housed in “the cloud”. My Evernote files we unreachable, except by 3G enabled devices. We use Google Docs and an online service to help track workflow in communications. We pulled the project list on our phones, and wrote them down. If we had to have a file, we would need to run to a local fast food joint and use their wifi. It’s tempting to snag a 3G modem or hotspot just in case this were to happen again. Most of our creativity this morning was used in figuring out how to work around the outage. In the end it was right at about 48 hours of no network access. I don’t want to go through it again. The internet/network has become like a utility. It’s not quite as important as power and water, but we do rely on it. When things work right, the technology we employ is a huge help. When it doesn’t work, it can be a roadblock. This was 2 days of trouble out of thousands without issue, so we will still be using the network and internet to help us get things done. An informal lunch with the SBC president today got me thinking about why the Southern Baptist Convention matters to me, or why it doesn’t. As the pastoral staff of the mega church I serve at gathered in the mall food court and ate our subs and “Jesus Chicken” (that’s Chic Fil-A to most people) we talked about the future of the convention. Generally I was very encouraged. It was refreshing to hear Bryant Wright speak with conviction and passion about reaching the world for Christ, and about how we could pray for him. His prayer request: that he will stay close to God and his family. The talk at lunch got me thinking about what it means to be a Southern Baptist. What does the SBC mean to me? If I woke up tomorrow and the SBC didn’t exist anymore, how would my life change? I grew up in a pastor’s home. I’ve attended a Southern Baptist Church since before I was born. As long as I can remember I have heard about the cooperative program and about politics in the convention. I believe that the single best organization for sending out missionaries is the Cooperative Program. A group of churches pooling their money can be more effective than a single church trying to send missionaries on it’s own. I believed that as I grew up and I believe it now. But how we actually do that is the subject of a lot of politics. Last year the convention took steps to improve how we do things. The Great Commission Resurgence. I know people who think this is the best thing ever, and people who think it’s terrible. What I know is that business as usual means a continued slide into irrelevance in the world. If this movement means we are going to be more effective in making disciples, great. We have the potential to reach the world, but do we have the will? Or will we forever be bogged down in political wrangling. Please hear me, the things people have debated in the SBC are important. I know that. Doctrine, theology, practices and polity matter. But when those things get in the way of actually making disciples we have a real problem. I have little interest in sitting through meetings and listening to people fight. Especially when the final decisions have so little impact on my day to day ministry. I do not want to lose the heritage of the Southern Baptist Convention, or the potential of the Cooperative Program, but the autonomous nature of the convention churches doesn’t force large churches to rely on the convention to carry out the mission God has called us to. How can the SBC mean more to me, and other ministers of my generation? Support the local work I am involved in, and help provide avenues for our local bodies to impact the world outside our immediate communities. I do not care to get involved in politics. I care about reaching the world for Christ, about making disciples. I care about helping people grow in relationship with Christ; helping them develop a passion for God, for people and to serve. It’s a rainy MLK day, and I’m home. What better time to speculate on what the next iPad version will be? Last year about this time a lot of people were wondering about the new tablet device Apple was about to unveil. Many thought it would be a real tablet computer running OSX, but a few thought it would be something else. There were plenty of different reactions after the announcement, but it didn’t take long to see that the iPad was going to be a huge success. Now, a year later, the rest of the computing world is trying to develop the iPad “killer, and more rumors swirl about the next iteration of the iPad. How will it change? For a while now people have been speculating on the new enclosure. There have been cases and mock ups that show a larger hole for a speaker. That would address one complaint about the current iPad, the speaker is just OK. It’s not bad, just OK. Many say flatter thinner case. Some have said that the bezel may be thinner, but I’m not sold on that. It all depends on the size f the new display and how the rest of the stuff inside has to fit together. Either way, it’s probable that your old iPad case won’t fit the new one. There will be a higher resolution display for the new iPad. It probably won’t be as dense as the retina display on the iPhone, but several sources are reporting that it should double the current resolution: 2048×1536, 260 DPI. This would likely require a new graphics package that would have a bonus effect; 1080p HD output capability. There will probaby also be a ne version of the A4 chip, which would then filter out to all iOS devices. I think it’s a safe bet that the new iPad will at least have a front facing camera. The more devices that Apple can add Facetime to, the better for them. I still don’t think a rear camera (like the iPhone or even the lesser one on the iPod Touch) would be used very much. It’s just not the right size device for a rear camera. iOS 4.3 is rumored to have some very nice touches. The ability to turn your 3G iOS device into a mobile hotspot (depending on carrier implementation, of course) as well as a more open AirPlay function. 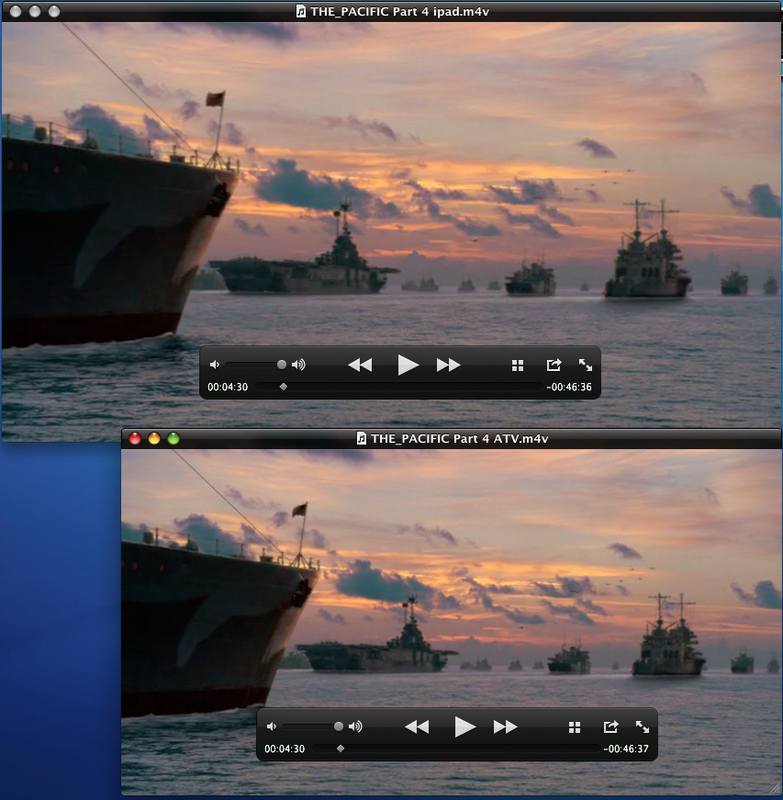 Third party developers should now be able to take advantage of streaming video via AirPlay. Just in time for the boxee app! 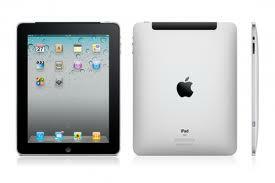 I said last year, and I will continue to say, the key to the iPad’s success is the apps that are developed for it. One year in, the hardware upgrades will be nice, but they still need apps developed to take full advantage of the potential. Ever have an idea so big it scares you? What do you you do with that kind of thing? Do you just forget it and move on, knowing there is little chance you can ever see it come to pass? Or do you consider pursuing it? At what point does a new idea, a big idea, become a dream? At what point do you just let it go? Since I’ve been using an iPad, I have been drift more and more toward a paperless existence. 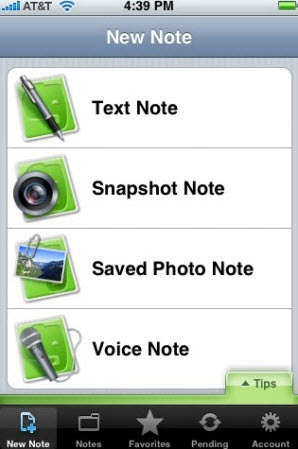 I couldn’t do it immediately, but once I found my preferred note taking app, I stopped carrying aper and pen to meetings. I started using Evernote last September, and it has changed my work life. Four months in I am still at the “free” level because I either have not adopted or just don’t need some of the features. But I did take another step toward using Evernote more fully, and toward using even less paper. No matter what I do I will always end up in a meeting with someone who has a paper handout. Or I may find myself with a scratched or scribbled note. I need to hang onto those things, and I don’t have an electronic copy. One great feature of Evernote is that you can email yourself files, which can be converted to searchable PDFs. You just need a scanner that can scan to PDF. I have a multi function printer in my area, and it can easily scan docs into PDF. I had a stack of paper on my desk that I just didn’t want to throw out. I finally got around to scanning it in, and even better I automated the upload to Evernote. Any email from the scanner that hits my Exchange account triggers a rule that forwards it to the Evernote upload email address. In a matter of minutes my desk was clean. Papers I’d had sitting there for a year had been scanned and uploaded. Now, whenever an wherever I need the docs they are available. I just need my computer, iPhone or iPad to access them. I’m sold. We have been experimenting with advertising through social media for almost a year now, and the results have been amazing. It got serious when I read an report of how a church compared a direct mail campaign with social media. They got 10 times the results for one tenth the cost. Here are out results from the last ad we placed: This was for a Christmas event. it was a free event, and did not require people to click through for a ticket. So we decided to pay by click, rather than impression. Our budget was a whopping $300. In the Orlando market, $300 won’t buy much of anything in traditional media. But that was what we had. That $300 garnered 1086385 impressions. Let me put commas in there- 1,086,385. As in over 1 million. I would expect to spend thousands of dollars to get the same result in traditional media. That’s $0.00028 per impression. A little under three one thousandths of a cent. Now, your results may vary, but in our market we chose to advertise to people in the orlando area, that liked music. That’s a large number of potential views. Here is where the beauty of social media advertising comes in. In traditional media, we have approximate numbers and general ideas of the demographics. We know certain stations and publications appeal to certain groups, but we don’t really know how many people see them, or whether they are actually our target audience or not. In social media advertising we not only know exactly how may times the ad was displayed, but we know for sure they fit into the criteria we selected for our target audience. So we can be sure that those million impressions at least had a passing interest in our event. That’s the cake. Then there is the icing: the people who see the advertisement can say they “like” it, and tell their friends. They can easily recommend our event to their friends online. With our ad, that did not require a click to get the information, did not require anyone to purchase anything, or do anything, we went from about 5 “likes” to 341. From those we saw 46,856 social impressions. That means that 46k times people saw that their friends liked our event. Now it’s not just an ad on the side of the page, but it’s a mention the news feed that my friend likes this. That’s under seven hundredths of a cent per social impression. Let me be clear, this was on advertisement for a specific kind of event. I don’t know if every ad we do will be this cost effective, but I can tell you that we will continue to do both traditional and social media advertising. How did the event do? Well, it was an outside event and got rained out. The real test of advertising is results, so we never got the physical proof that our mix of traditional and social media advertising was effective. But the stats from the the social media ads were very exciting. 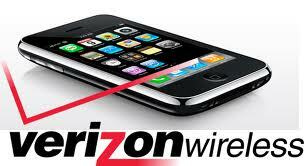 I know some of you have been chomping at the bit to get your hands on a Verizon iPhone. The much lamented AT&T network has many hoping to change, and the much liked iPhone has many Verizon subscribers ready to buy a new phone. But don’t do it. Not yet, anyway. Assuming the announcement from Verizon tomorrow is the new iPhone, there will be a lot of people who will purchase and pre order. Even if you want one, unless you are willing to stand in line or pre order and wait, it will be a while before you can walk into a store and buy one. And that may work to your advantage. The world should know by the end of the month if Apple is going to roll out a new iPhone version along with the rumored iPad 2. It will be a shame when all of the new Verizon customers realize just a few short weeks into owning an iPhone 4 that there is already a new version available for pre order. It won’t likely be available until early Summer, but when you lock into a 2 year contract, isn’t it nicer to have the newest phone for a little while? It is not definite that Apple will update the iPhone 4. There are mild rumors, but nothing like the major leaks last year. From the rumors, it looks like the new iPhone would just be a slight bump, and not a major re vamp of the device. Still, if it can take advantage of a faster than 3G network, or even just has the antenna issue addressed, the new version is worth the wait. Exercise patience, eager Verizon customers. Wait just a few weeks to see if the new iPhone does indeed come out this year. In an ongoing series testing the new presets found in the latest version of handbrake, 0.95, let’s compare the iPad preset with the Apple TV 2 preset. I ripped Part Four the the HBO series The Pacific. At a little over 51 minutes, the two files have very different sizes, which relates to the resolution of each reset. As always, I deselected “Large File Size” and selected “iPod 5G support” but made no other changes. The iPad preset file weighs in at 471 MB, while the Apple TV 2 preset files only hits 396.1 MB. The iPad is larger, 848×480, as opposed to the Apple TV 2 Preset which is 720×400. I’m not sure why the Apple TV 2 preset is set to that size, when it can play files as large, and larger than the 848×400. There doesn’t seem to be any real difference in quality or compression from preset to preset. Both versions load and play on my iPad, iPhone 3GS and iPod Touch (4th gen). They both look great on the smaller screen. The real test comes on the larger screen, watching via AirPlay. I tried both versions playing on my Apple TV 2 with Airplay. Generally they looked great. I was watching on a 30″ HDTV. 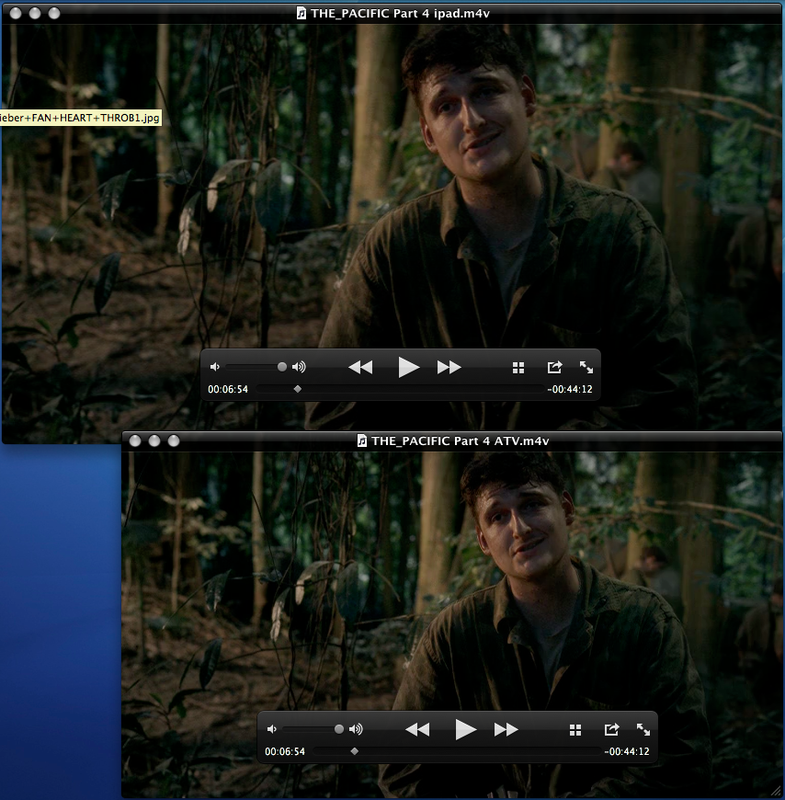 The smaller Apple TV preset file had just slightly more artifacts in darker scenes with light and shadow. Both had the artifacts, but the iPad preset version wasn’t quite as noticeable. If you have the space, the larger file size may be a worthy trade off. 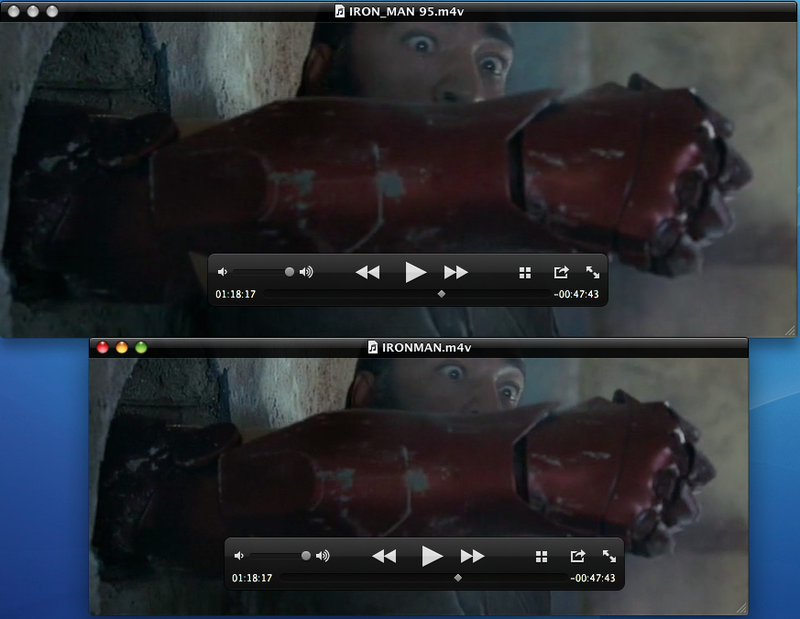 I started testing out the newest iteration of handbrake: 0.95. The new version comes with new presets for the ipad and the new Apple TV. I started with the iPad setting. As always I deselected the “Large File Size” box and selected the “iPod 5g Support” box. I also added a pass thru AC3 audio track in addition to the preset Dolby stereo track. As you can see the resolution is quite a bit higher than my old iPod preset (870×368 for the new preset vs 720×304 for the old). But the file size is a lot smaller. The smaller resolution file (based off an iPod preset I used in 0.94) is 1.9 GB, but the new one is 1.5 GB, with no real difference in quality. I scanned through the movie and did not notice any differences in compression artifacts, etc… The higher resolution is nice for large screens. Obviously, it looks great on small screens as well. I have so far tried this on my latest gen iPod Touch, iPhone 3GS and the iPad. It will not work on older iPod video devices, they are stll limited by a width of 720 pixels for video playback. I played from the 3GS to the new Apple TV via Airplay, and it looked great. I could see some compression artifacts in the background of darker scenes, but generally it looked as good as my other ripped files. Later I will test some video with the new Apple TV 2 preset.